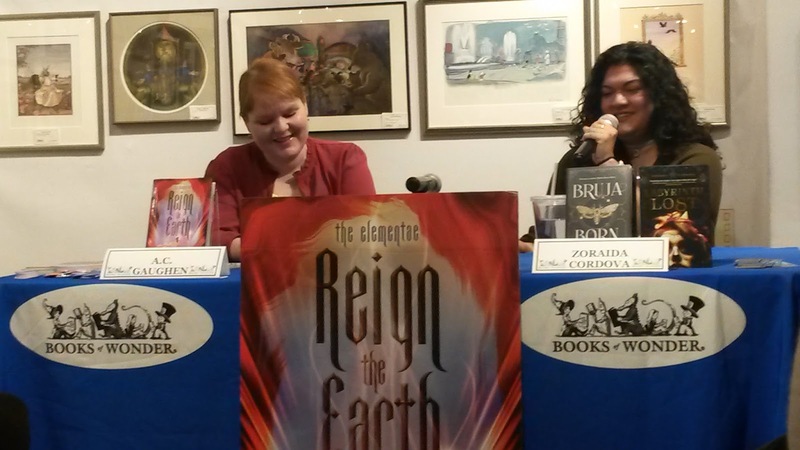 Well, it’s time for another author-signing event recap. This one was for A.C. Gaughen’s Reign the Earth tour, and it took place at NYC’s Books of Wonder. Thankfully, this was my last signing of January, and I don’t have another planned for February until later in the month. My wallet just can’t handle purchasing so many books at full price. Yikes. As for the event itself, it was fun. I was excited to meet Gaughen, since I really enjoyed her Scarlet trilogy. 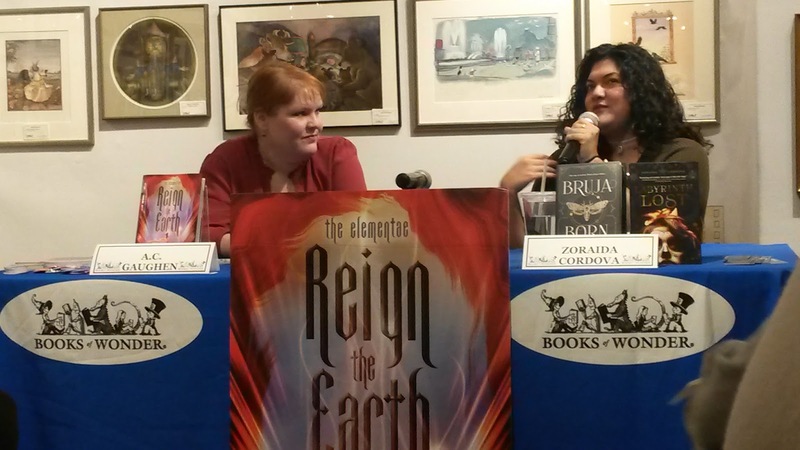 Zoraida Cordova, author of Labyrinth Lost, was co-hosting the event with Gaughen. Zoraida has such a bubbly and fun personality. I really need to read and buy her books. She pitched them as a Latina Charmed, so I think next time I see her at an event, I’ll buy Labyrinth Lost. Like most author events, there was a discussion portion and a signing portion. I have a brief-ish summary of what went down in the discussion portion (or at least, what I can remember from two weeks ago). During the event, Gaughen said she would be a water elementae because she’s a water baby. She loves to swim. Zoraida on the other hand loves being around water, but she can’t swim. Zoraida would actually like to be an air elementae, though, because air is all around her. At some point, Gaughen mentioned that she wouldn’t be able to survive in a desert because she’s too pale. The idea for Reign the Earth came to Gaughen when she was fifteen, but there have been many versions of the story over time. Some with magic, some without magic. She also wrote the current version of Reign the Earth when she was going through eye surgery. Oh, and something else she mentioned, her main character, Shalia, would be a Huffendor—a mix between a Hufflepuff and a Gryffindor with more emphasis on the Hufflepuff. Other random facts mentioned: Gaughen actually works with a nonprofit organization that empowers young women make a difference in their community, and Gaughen knows a lot about medieval torture. Zoraida would recommend The Belles for YA reading because it has a great magic system. She’d also recommend Six of Crows because it has great (found) family dynamics. Zoraida and Gaughen actually had their debut books release in the same year (2012, I believe), so the group of YA authors with this debut year all called themselves The Apocalypsies, for the end of the world schtick. Once the Q&A portion was done, there was the signing. Unfortunately, there weren’t a lot of people in line to get their books signed. Most of the attendees were, I believe, people who worked at Bloomsbury—Gaughen’s publisher. This meant, though, that I was sixth in line to get my book signed. Like I mentioned, I haven’t picked up Zoraida’s book yet, so I didn’t have anything for her to sign. 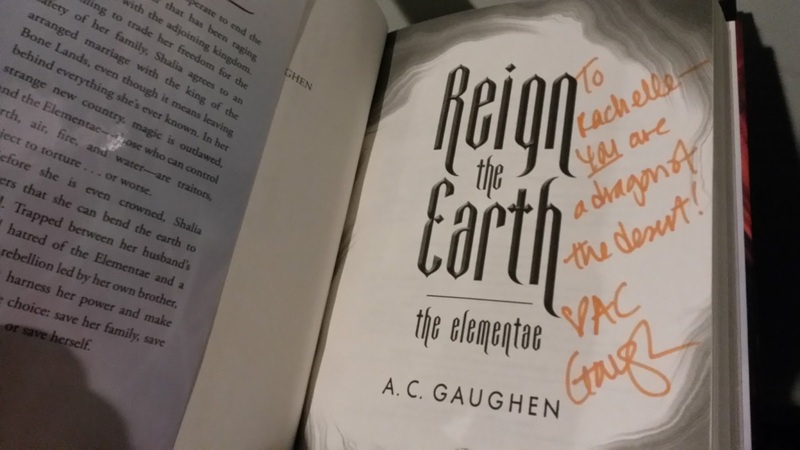 When I got to Gaughen, I mentioned that I owned her other trilogy, it was just chilling at my parents’ house in Missouri, and she mentioned how she used to live abroad for school. So, when she went home, she had to get rid of all her books. So sad. I told her I just plan on shipping mine back to Missouri if I don’t stay in NYC. All in all, this was a fun event that I wish more people would have attended. I just think a lot of people were tired from the Holly Black event that took place the day before.